One of the many joys of living in the Texoma area is being within minutes of the essential services (Starbucks, shopping centers, and of course the omnipresent Wal-Mart), while still being able to live in a rural-like setting. You know the neighborhoods we’re talking about: Just two blocks off a main road, homes are tucked into and behind a stand of enormous trees, sitting mostly hidden from view and noticed only by residents, and the occasional lost Sunday driver. These “urban retreats” are everywhere and they range from massive ranch estates to simple, unassuming, cottages. 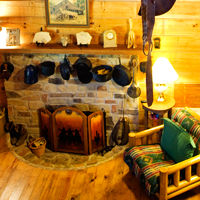 The James Family built their log cabin on a spot near the road on thirteen acres in 1993. Mr. and Mrs. James, their daughter and two sons did most of the work themselves. The electrical, plumbing, heat and air were subcontracted. But what makes this 1,500 sq. ft. house a home, is the collection of things found, things bought, and things bartered. On a visit you notice that on every wall, in every corner, there are both ordinary objects and oddities. What you notice most however, is the sense of warmth and comfort. That overstuffed chair is inviting you over for a sit and a cup of tea. Color is the hottest trend in landscaping all over the South. But to most homeowners in our area, color means one thing—water-thirsty plants—and we all know what a fragile resource water is. Is there a way to have it all in Texomaland? Can you punch up your landscape with high impact color, and still enjoy the satisfaction of knowing you’re a wise water steward?